31-Mar-2013 -- This is the report of our second confluence visit during our short stay in Cyprus. The first confluence visit is at 35°N 33°E. In the morning of confluence day, we left the historic village Ómodos located in the Tróodos mountain ranges. We drove all the way across Cyprus from the West to the East, thereby passing Lemesós and Lárnaka until we reached Agía Nápa, which is just 2 km from the confluence point. The whole trip can be covered on the motorways A1 and A3. I didn't tell Elionora about a second confluence point in Cyprus. So she was surprised when I suddenly let her stop the car at a t-intersection telling her that there is a confluence within 25 m distance. Indeed the exact location is right at the intersection (10 m in front of a stop sign) on the edge between the pavement and the next plot of a home. It is in a suburban area. Parking is directly on the opposite side of the street (Ioanninon Street). The beach is just 2 km away - it can't get more convenient. Normally I don't think that confluence points can be categorized into different degrees of difficulty, because it really depends on the current conditions and how familiar the visitor is to the area or country. But this point can no matter what be rated as 0 if that's the easiest possible rating. We didn't stay in Agía Nápa and went across the border on to Gazimağusa (Famagusta). The next day we flew back to Zurich from Lárnaka. 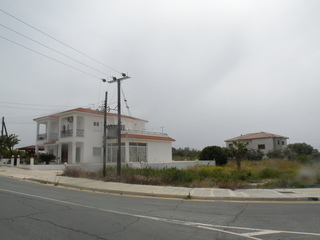 Vegetation: grass, little flowers, bushes and palm trees inside the homes.